A few weeks ago I started having problems initiating a connection with my 3G modem, but only with Orange; Safaricom worked just fine with the same USB dongle and the same software. I’m not sure if it was always like this, but Orange Kenya’s 3G service requires you to use #99***3# as the dial-up number. 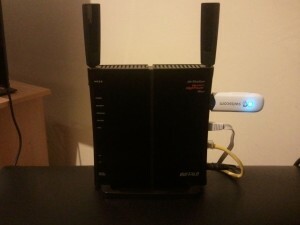 My home network uses a Buffalo Technologies WZR-HP-G300NH wireless router for both LAN and WAN connectivity. It has 1000Mbit Ethernet ports, supports 802.11n, and only cost me ~$70. Depending on my mood and the state of the software, I run either DD-WRT or OpenWRT firmware on the device. The stock firmware releases on this device have been rubbish since the day I bought it, and after-market firmwares have much more functionality (not to mention they’re both community-based, open-source software projects). January 1, 2012 January 1, 2012 Alan OrthComments are off for this post. Fantastic, would like to have that setup… did you buy the Buffalo Router locally? Nope, unfortunately! I bought it when I was in the US earlier this year. There are other routers with similar specs which are available in Kenya. The TP Link TL-MR3220 has a USB port and is supported by OpenWRT (always a bonus). I’ve seen it for 7,000 shillings in tao (at the Phone Xpress in Lifestyle). I sold my Buffalo like a year ago, sorry! But if I recall correctly, the Buffalo version of DD-WRT didn’t have the 3G stuff… try using the actual third-party DD-WRT or OpenWRT firmwares if they’re supported on that device. I’m trying to use an Orange umts modem on a TP-Link MR3420 using openwrt 10.03.1 final (from 21 Dec 2011) and I can’t get it to stay connected – it connects and then hangs up immediately. Please can you post the log from a successful connection from your DD-WRT so I can see what’s different :-). For what it’s worth, I used to see that same behavior when using the wrong dial up number when connecting with Orange. Which number are you using? It connects every time (regardless of the combination I am using, but hangs up after 3 seconds). If I use #99***3* as you described above I can’t even dial, so I wondered if the text in the web interface was different to the actual number being dialled. I also wondered what AT_CGDCONT= value you were using. I suppose you could look in the chat script…? I’m trying to use the Orange modem in combination with a Safaricom one for load balancing and failover (and because Safaricom gives you a public IP address and Orange doesnt). After adding debug to pppd options in /etc/config/network and doing some Google-fu I worked that Orange hangs up if you propose an ip address. So adding noipdefault to pppd options in /etc/config/network and rebooting seems to have fixed the problem. I realise that this isn’t relevant to you, but it might be to the next poor soul sent here by Google who is trying to make Orange Kenya work with Linux without the wvdial installation provided with the modem! I actually prefer OpenWRT over DD-WRT, but I started having problems with my Orange line and eventually settled on DD-WRT for that and a few other reasons. I’m using Gargoyle (based on OpenWRT) now, and I had the same exact problem you described. I remember you having this issue so I came to check. Sure enough, the problem was the same! It seems suggesting an IP to Orange is bad! Great detective work, Roger. Now I’m back on OpenWRT! I am having the same issues that you have had with the same TL-MR3420. Can you please help me with the details. Whoa, impressive. I’ve never seen that before. Thanks for sharing. I just came across the website – awesome!! but it is not working for me. I tried to run the install.sh as root and it copies. Uninstall always says the driver (/opt/driver) does not exist. Pl help – i want to get from a mere ubuntu newbie to at least ubuntu-intermediate!! Are you installing straight from the mounted CDROM? Unfortunately, I didn’t have a ZTE modem to test the actual connection. It looks like the binary Internet_Everywhere_3G+ shipped with the modem is built for 32-bit architectures. 12-05-08 16:06:43SerialThread: need to findPortName! Hope this helps. Kindly let us know if this workd. Turns out Huawei also ships a Linux modem manager with the modem. Whoa, fancy! I’m impressed… things have come a long way since I used to write wvdial config files by hand! Excellent. Let me check it out. OpenSuse 12.1 Newbie | Widoze GURU! Apparently, the dashboard directory is a 32-bit binary, and as it loads, it will look for 32-bit system libraries first, NOT 64 bit. And then run it as root. That proprietary driver from ZTE will disable NetworkManager service, rendering WiFi and Ethernet unusable. Take note. Stick to #FOSS and use gnome-ppp or if you’re on KDE, kppp. Man, am stuck on choice. Am thinking of getting this router or a dual band one. But am working with an ZTE mf192 which can be a b**h sometimes. The damn thing would not play nice with my dir412 router for a couple weeks. Had to disable virtual rom using hyperterminal and then downgrade the firmware of the router to something I found in an AU website. Plus the dir-412 is not openwrt or ddwrt supported. Any ideas on what router I should get? i tried upgrading my zte mf 192 orange modem from Edge to 3G. during the process l lost the drivers. could you please help me to get my modem back to its former state?